An international team of experts reported today [Feb 19th 2013] that evidence linking hormone-mimicking chemicals to human health problems has grown stronger over the past decade, becoming a “global threat” that should be addressed. The report is a joint effort by the World Health Organization and the United Nations Environment Programme to give policymakers the latest information on chemicals that alter the hormones of people and wildlife. The panel of 16 scientists from 10 nations in North America, Europe, Africa and Asia found that endocrine-related diseases and disorders are on the rise. There is now “emerging evidence for adverse reproductive outcomes” and “mounting evidence” for effects on thyroids, brains and metabolism, according to the report summary. “Over the past decade, we know much better that chronic diseases, ones related to the endocrine system, are increasing globally,” said Thomas Zoeller, a professor at the University of Massachusetts, Amherst and a co-author of the report. Such diseases include male reproductive problems, pregnancy complications, certain cancers, obesity and brain development. Many factors can cause these diseases, but the report concludes that given how fast some are rising, environmental chemicals are likely playing a role. Fetuses, babies and young children “are not just little adults” and are the most vulnerable to hormone-altering chemicals since their bodies are still developing, the authors wrote. Zoeller said the goal of the report is to update world leaders on a topic that is complex and, at times, controversial. A decade ago the biggest threat was thought to be persistent organic pollutant chemicals – such as DDT and polychlorinated biphenyls (PCBs). These chemicals – now banned in the United States — traveled the globe, persisted in the environment and caused severe population declines in some wildlife species. Such contaminants still pose a threat. However, less persistent but more ubiquitous chemicals found in everyday products – such as bisphenol A (BPA) and phthalates – now are increasingly linked to human health problems. The new report concludes that the link to human health impacts has been strengthened since the 2002 report, shown above. The report points to previous regulations, such as the 2000 U.S. restrictions on chloropyrifos, as an option to protect people. After the pesticide was banned from residential use, children’s blood levels in New York were cut in half within two years. Also, lead bans greatly reduced children’s exposure. But government agencies and industry groups remain unconvinced. The American Chemistry Council, which represents chemical companies, has repeatedly questioned the validity of studies linking two of the most pervasive endocrine disruptors — BPA and phthalates. Countries should consider restricting “certain chemicals in order to reduce exposure early, even where there are significant but incomplete data.”- State of the Science, Endocrine Disrupting Chemicals 2012The U.S. Food and Drug Administration last year said “the scientific evidence at this time does not suggest that the very low levels of human exposure to BPA through the diet are unsafe.” The FDA and U.S. Environmental Protection Agency are analyzing whether to restrict use of the chemical, which is found in polycarbonate plastic, canned food liners and some paper receipts and dental sealants. The report also cites threats to wildlife, particularly killer whales and harbour seals. Both have high levels of PCBs and flame retardants that accumulate in ocean ecosystems. 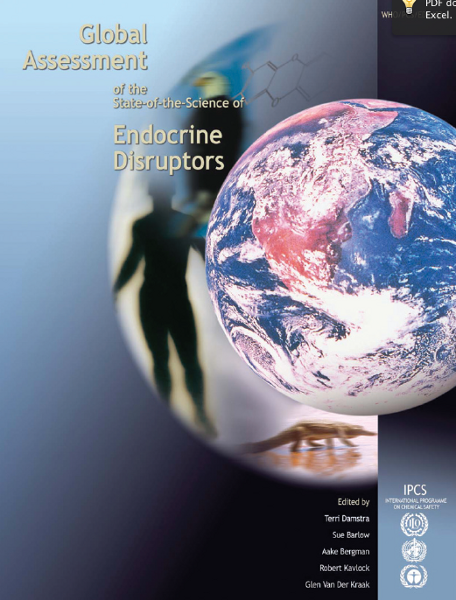 One problem vexing those who study endocrine-disrupting chemicals is the vast number of them – about 800 are known – and how they may interact with one another. They’re in a variety of goods – such as pesticides, flame retardants, plastics, cosmetics and canned foods – and research has only touched the “tip of the iceberg,” according to the report. “The vast majority of chemicals in current commercial use have not been tested at all,” the authors wrote in the summary. Unless we know where the chemicals are used, and they’re tested, it’s tough to make informed decisions on how to protect people, Woodruff said. But she said developed countries such as the United States have proven that they can greatly reduce exposures to contaminants they find problematic, such as those in air pollution. For more about how to stay healthy naturally and holistic therapies, why not join us at The Therapy Book? Just click on the book below.